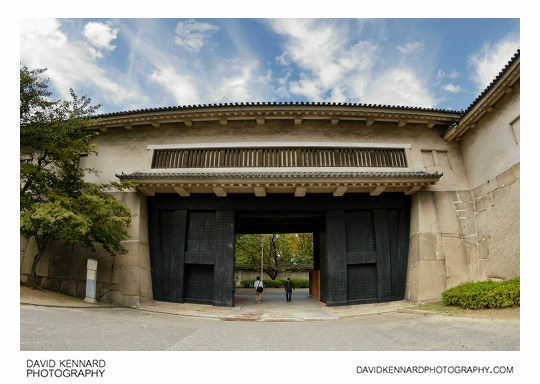 The main entrance to Osaka Castle (大坂城; 大阪城; Ōsaka-jō) is via a bridge at over the outer moat at the west of the castle. I took the photo above looking north over the moat from the bridge. On the right you can see another surviving turret (many of the turrets have been lost), Sengan turret (千貫櫓; Sengan-yagura). There is a story about the turret's name, it is said that the turret got its name from the period before the castle was built, when the area was the location of the Ishiyama Hongan-ji fortress temple. The fortress was under siege by the forces of Oda Nobunaga for 11 years, and the Oda commanders offered a large amount of money - one thousand (千; sen) kan (貫 - a unit of money at that time), to anyone who could take this position. Ōtemon (大手門; Ōte-Mon) is the main entrance gate of Osaka Castle. The people in the above photo give a good sense of proportion to how large the gate and the stones used in construction of the walls are. 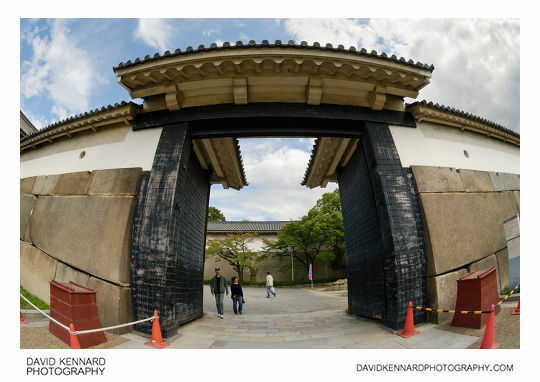 The gate was built in 1628 as part of the castle improvements and reconstruction ordered by the Shogun Tokugawa Hidetada. Ōte-Mon was built with thick iron doors to prevent damage from weapons, and has been designated an Important Cultural Asset of Japan. Ōtemon leads into a small square area surrounded with large stone walls, and you then need to pass through Daimon, the gate in the above photo, before you can access the rest of the castle. Daimon is built into Tamon turret (多聞櫓; Tamon-Yagura), so if any attackers did manage to make it through Ōtemon, they would be under heavy fire in small enclosed area while they tried to break through Daimon. Tamon Yagura is the largest remaining turret of this type in Japan, and has been designated as an Important Cultural Asset by the Japanese government. Once into the castle we walked down a road to the east for a bit, then crossed a bridge over the inner moat to the inner bailey. The entrance area of the inner bailey is again a square with large stone walls on each side, called Sakura Gate Stone Square (桜門枡形の巨石; Sakuramon masugata no kiyoseki). 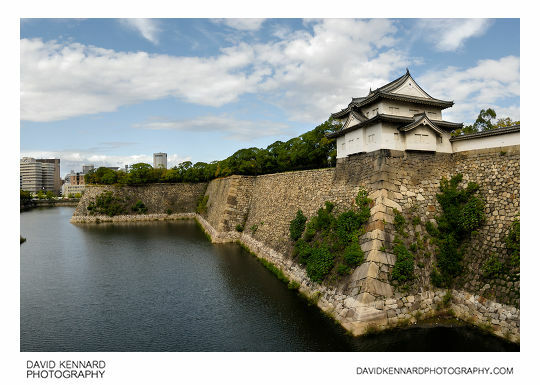 The wall here contains two of the largest stones used in the construction of Osaka Castle. In the photo above you can see the Octopus Stone (蛸石; Takoisi) on the left, which has a surface area of 60m² and estimated weight on 130 tons. This is the largest stone used in the castle. 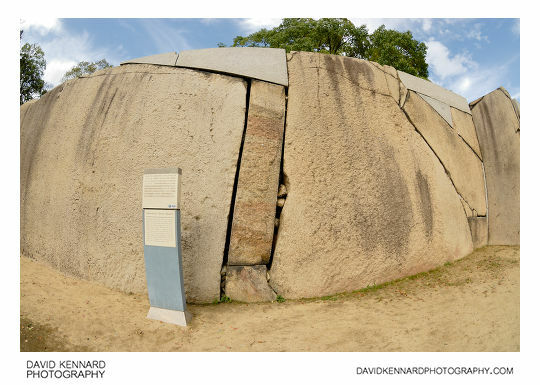 The third largest stone used in the castle is also part of this wall, the Kimono Sleeve Stone (振袖石; Furisode-seki). This stone has a surface area of 54m² and is estimated to weigh 120 tons. Once finally into the inner area of the castle you come to Osaka Castle's main tower （天守閣; Tenshukaku). You can see in the above photo there was a school visiting while we there as well. 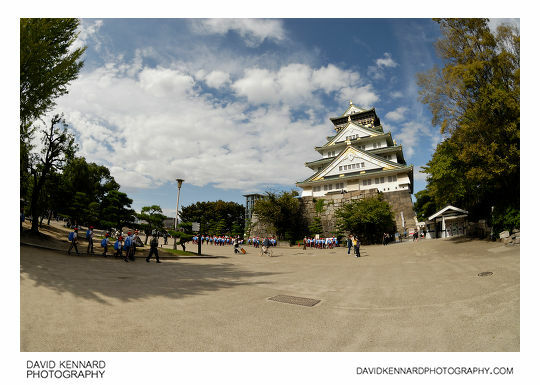 There seemed quite often to be schools visiting the different attractions we visited in Japan.